Many people want to know how to awaken the Kundalini. And as there are techniques for Kundalini Awakening, most of the techniques are kept secret by masters until the student is ready to receive them. The first part of this technique for kundalini awakening is to focus your breath starting at the base of your spine all the way up your spine and out of the top of your head. Do this for the inhale. As you inhale move your focus from the base of your spine, up the spine and out of the top of your head as though your are “breathing up” the energy. And the focus should be relaxed. You are not to force anything. You are simply gently suggesting the energy to move in this direction. So do focus the energy up but allow the kundalini energy to move on it’s own without force. After practicing this for a while, you will start to feel the energy rising. The sensations will be subtle at first but over time can become very blissful. It can almost feel like a big”O”, a rush of bliss moving up your spine. 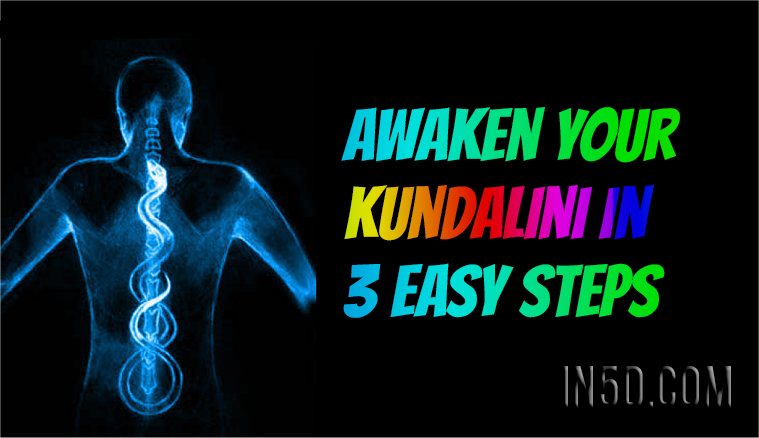 The third part of this technique for kundalini awakening is to awaken the energy. Because an enlightened teacher would not give this technique without initiating you into this technique. This calls for the teacher to give you shaktipat, to actually awaken your kundalini by touch, chanting or simply by focusing their energy on you. So to awaken this energy yourself, there is an easy technique but a very important one. And that is to silently repeat the name of an enlightened teacher, Guru or Saint that you feel connected to whether you have met them or not. If you are of a particular religion, you can repeat the name of a saint of that religion. Otherwise, choose an enlightened teacher who you admire. You can repeat the name as you inhale, and repeat the name as you exhale. The reason for this is that you take on the Shakti (energy) of what you focus on. So simply by repeating the name of an enlightened Guru or Saint, you take on their energy, their state of bliss. This technique is thousands of years old and is still used today because it is so effective. Really, you are awakening that which is in you, not something from the outside. But enlightened teachers are the outward manifestation of what is inside you. A Saint or Guru have awakened what you wish also to awaken. So by focusing on their name, you awaken that energy in you. It has nothing to do with them as a personality or body but the energy that naturally radiates from them.